Sabrina the Teenage Witch was huge in the 90’s. Telling the story of how protagonist Sabrina Spellman discovers on her sixteenth birthday that she is half witch, half mortal and capable of doing magic. The series followed her many adventures through a magic door in her linen closet with her trusty sidekick Salem, the talking cat. Guided by her two aunts and a number of celebrity guests, including Britney Spears on one occasion, Sabrina the Teenage Witch was a campy, feel good, nineties fuelled kaleidoscope capturing the fun side of witchcraft. Chilling Adventures of Sabrina is something completely different. Based on the hugely successful and critically acclaimed graphic novel series, Chilling Adventures of Sabrina does not so much as reimagine 90’s Sabrina, as kill her and dance on her grave covered in blood. In this re-telling, Sabrina is preparing for her sixteenth birthday and Dark Baptism, where she will sign her name in the Dark Lords book pledging herself to him for eternity, that’s Satan in case there was any confusion! Except she has reservations about leaving the mortal world behind, particularly her boyfriend Harvey. As her Dark Baptism draws nearer and her commitment to the dark path wavers it becomes increasingly clear that stepping away from the Dark Lord isn’t as easy as she might have hoped. He isn’t going to let her go without a fight, and so the battle for her soul begins. From the moment the show kicks off we know we are not in the 90’s anymore. Violent deaths, sacrifices, dead bodies and terrifying scarecrows haunt nearly every frame. The series is brilliantly shot with every frame a delight to behold and the attention to detail is stunning. Set in a sort of 60’s Americana style town yet also rooted in the present day, the world of the Chilling Adventures of Sabrina is sumptuously rich and textured. 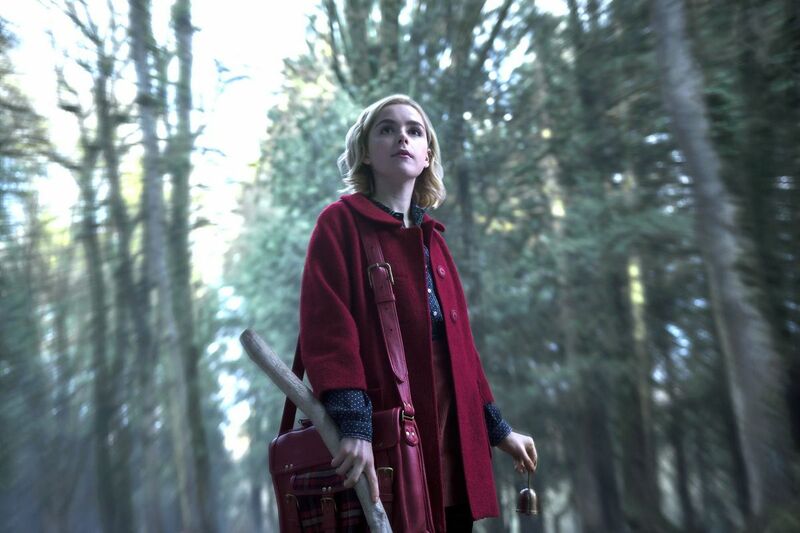 Sabrina is played brilliantly by Kiernan Shipka (formerly little Sally Draper of Mad Men) who brings a real truth to the role, making the stakes terrifyingly high as she fights for the right to her soul. The show fulfils its promise of being as chilling as it can possibly get without making the audience faint (something Netflix is currently achieving with its other spook-filled show The Haunting of Hill House) and with its release on Friday 26th will make for a perfect Halloween treat. If you were expecting the light-hearted romps of the original, I’m sorry to say, you won’t find them here. The old Sabrina is dead, long may the new one reign.